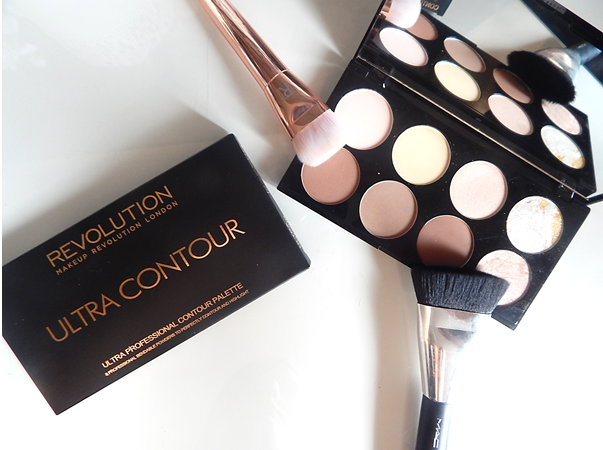 As soon as I heard that Makeup Revolution were releasing a Contour Palette, I headed straight to their website and popped it into my basket. It arrived a couple of days ago and I've been giving it a whirl ever since. Three words - I. Love. It. The Ultra Contour Palette (£8.00) contains three contour powders and three highlight powders, and then two actual highlighters. The powders are great quality with good pigmentation and there's a shade for every skintone to get the perfect contour. I prefer to use concealer to highlight, but the powders are perfect for setting that highlight in place. The first shade is a matte salmon-pink, the second is a matte yellow and the third is a shimmery peach - a very subtle highlight shade if you will. The contour shades are also great and easy to use. The first being a medium warm-toned brown, the second is a very cool-toned brown (great for pale skin) and the third is quite a dark warm-toned brown. The highlighters themselves are extremely pigmented and need the lightest of hands to apply them with. One's a very stark highlighter (almost white) and the other is browner, more complexion appropriate I'd say. I like to use the lighter one for a brow and inner corner highlight - it works beautifully for that. If you're into contour and highlight, I definitely recommend giving this a whirl. I can see it becoming a staple in my daily makeup routine.